In a small saucepan, bring bulgur and the water to boiling, then reduce the heat. Simmer, covered, for about 5 minutes or until the water is almost absorbed. Remove from heat. Let stand, covered for 10 minutes. Shred 1/2 teaspoon peel from one of the oranges into a large bowl. Juice one of the oranges and add the the peel. Cut the peel and all the white pith off the remaining two oranges. Working over the large bowl (to catch the juice), cut sections from the oranges, letting them fall into the bowl. 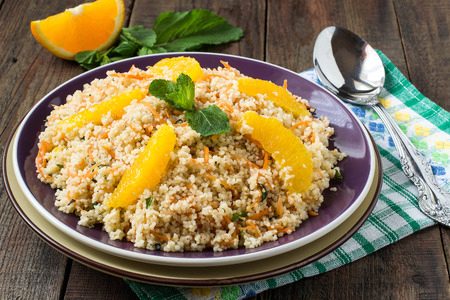 Add all the remaining ingredients (except the bulgur) to the oranges. Toss gently to combine. Add undrained bulgur and toss again to coat. Serve immediately or, for a cold tabbouleh, chill, covered, for 4-24 hours, stirring once or twice.